1-CD with 12-page booklet, 12 tracks. Playing time approx. 44 mns. 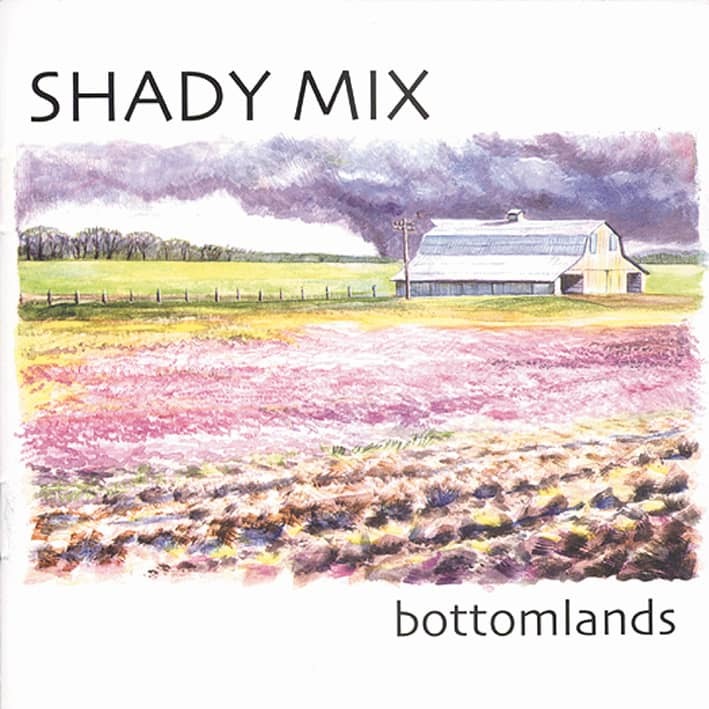 'Bottomlands' is the newest release from the german/american acoustic country band Shady Mix. Shady Mix found its bluegrass beginnings in 1989 on the front porch of an old 8x40 trailer in Southern Illinois, not far from the Mississippi River. Now, nine years, two continents, and four albums later, the stylistic shift is complete. Founding members Wil Maring and Mark Stoffel have combined the impressive talents of german Shady Mix members Wolfgang Göhringer, acoustic and electric guitars; Willie Jones, vocals, acoustic bass; and Uli Jenne, drums; with Wil's own beautiful voice and songwriting, and Mark's tasty fiddle and mandolin work to create an Americana masterpiece. With a generous helping of traditional country, a dash and a half of bluegrass and the distinctive flavorings of progressive folk, Shady Mix has found the right recipe to satisfy every Americana and roots music fan. The seven original songs and five well-arranged cover songs on 'Bottomlands' follow a path worn through the heartland of America by the Mississippi River and its tributaries, reflecting the sentiments and lifestyles of the people that live along the shores and on the floodplains. Shady Mix pledges allegiance to its roots with the Louvin Brothers classic, Cash On The Barrelhead and bends the heartstrings with beautiful renditions of Louisiana 1927 and Satisfied Mind. Willie Jones contributes powerful lead vocals on four cuts. Original tunes like Down To The Levee, Mississippi Lullaby, River Road, and, the title cut Bottomlands touch the heart, stir the memory, and create that ice-tea sippin', front-porch rockin' atmosphere that every listener will enjoy. Shady Mix was founded in 1989 in Carbondale, Illinois, USA, when one evening German native Mark Stoffel and musical partner Wil Maring received a call that a music club on the shores of the Mississippi River in nearby Missouri needed a bluegrass band to play regularly. The original Shady Mixers, in addition to Wil and Mark, were Kelley Sims, lead guitar and vocal, and Geoff Maring on standup bass. For many of the gigs, Doug Knecht came from Peoria, IL. to sit in on banjo. From humble beginnings as the house bluegrass band of "Port Cape", Shady Mix moved on to perform at regional music festivals and on local radio and television stations, soon becoming one of the most well-known bluegrass groups in their area. Their first CD, Made in the Shade was released in late 1991 with the original members. In 1992 Shady Mix toured Europe for the first time to play before enthusiastic audiences. After Wil and Mark's relocation to Germany in late 1992, Shady Mix was reformed with German members, with special attention paid that the band sound would remain acoustically oriented. Thanks to the help of excellent resident musicians from the Munich area, Shady Mix continued to entertain excited audiences on the European side of the Atlantic. The Shady Mix musical style in Europe broadened from bluegrass into what is now termed "Americana" roots music. In 1996 they released "Songs of the Ranch and Range", a highly acclaimed collection of cowboy and western swing music. After the its release they received a glowing review from Rolling Stone Europe and the nomination for "Newcomer of the Year" by the German/American Country Music Federation. 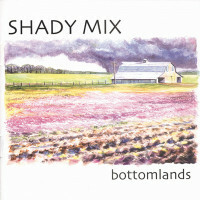 In 1998 they released "Bottomlands" using Wil's award-winning song as the title cut. "Bottomlands" is a collection of mostly original music from the European Shady Mix band members. In September 2001, after almost of a decade of professional music in Europe, Mark and Wil made the decision to move back to the U.S. The German formation of Shady Mix gave its last concert at Munich's famous Rattlesnake Saloon. Wil and Mark's move back to the U.S. began a new chapter in the history of a band that will hopefully be making beautiful acoustic music for many years to come. They wasted no time reviving Shady Mix back home in Southern Illinois, much to the delight of their old fans, and immediately began gaining new fans on this side of the Atlantic. The newest Shady Mixer is the veteran Bill Monroe/Osborne Bros./Kathy Mattea band member, multi-instrumentalist Robert Bowlin. An amazing artist in his own right, Robert's versatile and virtuose musical style on guitar and fiddle complement the Shady Mix's unique hybrid acoustic sound perfectly.